The Project Teams Gathering (PTG) is an event organized by the OpenStack Foundation. It provides meeting facilities allowing the various technical community groups working on OSF projects to meet in-person, exchange and get work done in a productive setting. It lets those various groups discuss their priorities for the upcoming 6 months, assign work items, iterate quickly on solutions for complex problems, and make fast progress on critical issues. The co-location of those various meetings, combined with the dynamic scheduling of the event, make it easy to get specific people in the same room to discuss a specific topic, or participate in multiple team meetings. Evenings allow for relationship building and problem sharing. Leaders from teams, SIGs, working groups that decide not to meet at the PTG should attend to represent the views of their group at the event. The event is optimized for engaged community members that are involved in one of the various teams working on one of the projects supported by the OSF (workgroups, development teams, SIGs…). If you’re brand new to OSF projects, you might want to attend the Open Infrastructure Summit event instead, which features presentations, forum sessions (designed to get wider community feedback) and on-boarding sessions. The event is not the occasion to sell goods or to propose jobs to the attendees -- hiring managers and product vendors will therefore also probably feel out of place. How can this benefit my organization? Our community is global. This creates challenges that cannot easily be solved using asynchronous, low-bandwidth communication tools. Getting technical community members to meet in-person regularly is essential to build the amount of shared understandings and trust that is necessary to successfully cooperate. Participants to the event are therefore a lot more productive and efficient the rest of the year. PTG’s are organized in cost-effective transportation hubs in order to minimize travel expense. At the same time, we aim to maximize the ability of contributors to work through their workgroup objectives in an environment that is focused towards work and productivity. If you need Travel Support in order to attend the PTG in Denver, please apply using the form found on the Open Infrastructure Summit Denver website. All attendees of the Project Teams Gathering must follow the OpenStack Foundation community Code of Conduct. What are PTG Events & Why Sponsor? The Project Teams Gathering (PTG) is a biannual event organized by the OpenStack Foundation that will take place in Q2 and Q4 at the Open Infrastructure Summits in 2019. The PTG is where contributor work is being organized in open source projects supported by the OSF. It could be considered a “mega midcycle” gathering for all contributors. PTG events aim to maximize the ability of operators and contributors to work through their project objectives in an environment that is focused towards work, productivity, and relationship building. Getting all contributors together throughout the year allows them to build the amount of shared understandings and trust that is necessary to successfully cooperate and achieve community objectives over the next six months. The PTG events are critically important to the OSF projects development process. 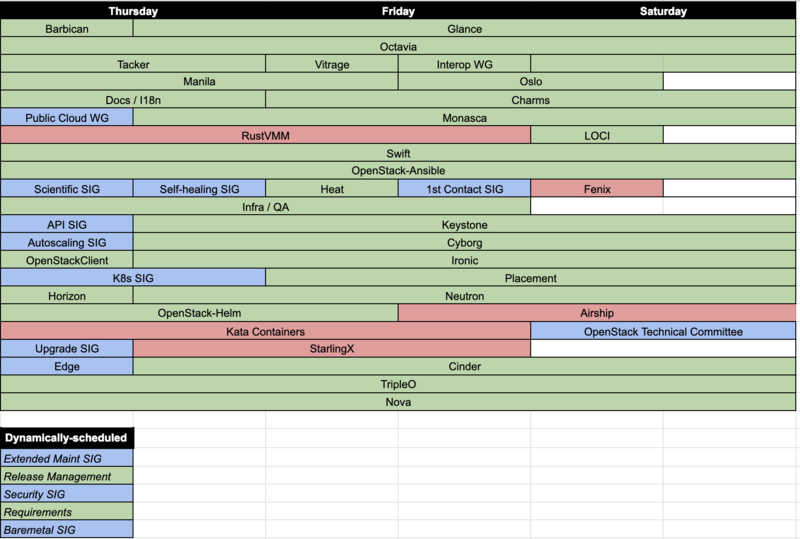 Sponsoring these events will greatly help ensure the continued growth and success of Open Infrastructure Contact [email protected] with any questions. • Opportunity to create one “housekeeping” advertisement slide to be displayed on rotation on a monitor in the PTG venue. Please email [email protected] if you are interested in sponsoring! Travel Support is currently closed. Q: Are operators welcome to the PTG? A: Yes! Engaged operators and developers are all contributors, helping to make our projects better. If the teams, workgroups or SIGs they are involved with are taking the opportunity to meet at the PTG, all team members should join to get work done with their co-workers. Q: Which groups can meet at the PTG? A: There are lots of ways to contribute. We have upstream project teams, User Committee working groups, Special Interest Groups (SIGs), pop-up work groups around a specific issue, and other styles of teams. Event organizers have taken a pretty liberal approach as to which group can request a “track” at the event: if you’re engaged and openly collaborating to make one of the OSF-supported open source project better, your team can get space to meet at the PTG! Q: Is my workgroup forced to meet at the PTG? Q: Why are you co-hosting PTGs with Summits? A: When PTGs were first introduced, we ran them as a completely-separated time and location from our other events. It allowed us to have a productive week away from the distraction of the gigantic show that the OpenStack Summit had become. But one issue with running PTGs at completely different times from Summits was the difficulty to justify going to four events per year internationally to follow our projects. As a result, in 2019 a different trade-off will be tried: the PTGs will stay as a separated event, but will be co-located in the same city and week as the Summits. This should reduce the number of travels required, at the expense of making a long work week. A: The Forum is a community-driven, open design event happening at the Summit. It is primarily focused on strategic discussions and planning for the future of our projects (the “what”). The idea is to take advantage of having all of our community (Devs, Ops, End users…) represented to hold cross-community discussions there. That means getting feedback from users and operators over specific projects in our last releases, gathering pain points and priorities for upcoming development, proposing changes and see what the community thinks of them, and recruiting and onboarding new team members. Q: What is the difference between PTGs and Forums? A: The Forum is a part of the OpenStack Summit event. It has a pre-announced schedule, organized in 40-min slots to discuss specific topics. The Forum takes advantage of having a larger cross-section of our community present to gather wide feedback on strategic issues, helping to shape the future of OpenStack and set priorities. At the Forum, we discuss the “what”, we take the pulse of the community, we engage outside of our existing teams and established contributor base. In contrast, the PTG is more to discuss within our contributor teams, between people engaged to actively work on making OpenStack better. At the PTGs, we discuss the “how”, get agreement, build trust, assign work items and get work done. The PTG is dynamically scheduled during the event itself, to give teams a lot of flexibility and maximize productivity. Q: Are ops and devs still needed at the main Summit? A: Operators and developers are still very much needed at the main Summit. The Summit is where all of the OpenStack community gets together and where the feedback loop happens. All teams need to be represented there, to engage in strategic discussions, collect the feedback on their project, communicate about their group work, discuss cross-community topics, reach out to new people and onboard new developers. We also very much want to have operators and developers give presentations at the conference portion of the Summit. Q: The Project Teams Gathering sounds like a huge event. How am I expected to be productive there? Or to be able to build social bonds with my small team? A: Project Teams Gatherings are much smaller events compared to Summits (think 300 people rather than 3000). Each workgroup is allocated a specific, separate meeting area, in which they will be able to organize their schedule and work however they see fit. Past attendees have described the PTG as one of the most productive events they ever attended. The only moment where everyone meets is around lunch. We organize a limited number of social events (happy hours, karaoke, game night) and encourage teams to organize team dinners and build strong social bonds. Most questions can be answered by reading the PTG FAQs. Still more questions? Email [email protected] or add your email below to be kept up to date with the latest about Project Teams Gathering. Thank you for your interest in the Project Teams Gathering. You will be notified of any important updates.